If you want true wireless earbuds but you don’t want to spend over $150 on AirPods or even more on our favorite cord-free earphones, the Master & Dynamic MW07, then Amazon has a deal for you today that you’re not going to want to miss. 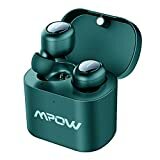 The Mpow TWS Wireless Earbuds normally retail for $55, and they’re worth every penny thanks to great sound quality and solid battery life. Right now ahead of Black Friday 2018, however, you can snag them at an all-time low of just $36.99!